Bundaberg Rum is a very Queensland spirit and not to everyone’s taste. Dad of course won’t drink any other kind of rum. It’s not even served in a lot of places south of the Queensland boarder. You can always use another rum, but use “Bundy” if you can. These are very easy and quick to make (no baking required! ), make great Christmas gifts and are perfect for when friends drop round during the silly season. Recipe makes approximately 30-40 balls (depending on size of balls). I usually make double (or triple) quantities, as they go so quickly! Finely crush biscuits in a food processor. Add cocoa powder, desiccated coconut, sweetened condensed milk and rum to crushed biscuits. Combine all ingredients well (you should end up with a stiff mixture). If it is a particularly hot day, or your mixture isn’t quite stiff enough for the balls to hold their shape, put the mixture in the fridge for 30 minutes or so before rolling. 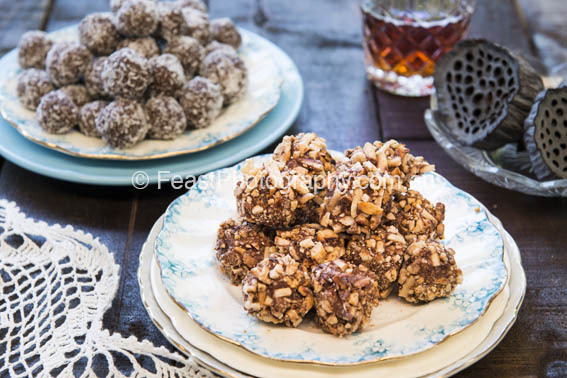 Take large teaspoons of mixture and roll into balls using your hands, then roll balls in extra coconut to coat. Alternatively, you can melt chocolate in a double boiler then dip the balls in chocolate and roll in finely chopped hazelnuts. Place in a single layer on a baking sheet or shallow plastic container and put in freezer. Once frozen, put into a container and keep in the freezer until ready to use.